Usually, on a Saturday night, you will find me teetering around on sky-high heels enjoying Belfast’s social scene. Last Saturday was somewhat different. For the tenth of my 29 Lives, I agreed to take on the challenge of being ‘The Good Samaritan’ by volunteering for a night on the SOS Bus. Swapping my stilettos for flats and a cosy yellow SOS Bus fleece, I prepared to face an unusual Saturday night feeding and watering the city’s revelers, instead of being one myself. My night started with a trip around Belfast in the SOS minibus looking out for people in distress with long-standing volunteers, Grace and George. During the hour we spent driving around the city, I was inducted into the world of an SOS Bus volunteer, hearing heartwarming and often funny stories about their experiences over the years. After our patrol, we went back to the SOS Bus stationed outside the Odyssey Pavilion. By all accounts, Saturday was quieter than usual, with many of the students having left the city for the summer, flocking back to their respective homesteads. But it was busy enough. Before long, a steady stream of people began visiting the bus and I, along with a group of my fellow volunteers, began handing out free hot drinks, bread, pancakes and biscuits to rain soaked revelers and people passing by after the Land of Giants show in the Titanic Quarter. Over 700 hot drinks were served at the Odyssey bus alone. In respect of the patrons of the SOS Bus, I cannot go into the specifics of people that were cared for on Saturday night. But suffice to say, I bore close witness to projectile vomiting and learnt first-hand why there are several large holes in the floor of the bus named ‘carrot holes,’ which have been designed, I’m assured, so that even the largest carrot can be pushed down through them. Joking aside, on Saturday, along with my fellow volunteers, we helped a number of vulnerable young people find their feet, and a safe way home. It’s hard to explain but it was a very rewarding experience. During my induction, SOS founder, Joe Hyland shared some useful advice to help me through the evening. And it is that simple. There are no ulterior motives. There is no catch. The hundreds of cups of tea, coffee and soup served by the SOS Bus are not doled out with a side order of sermon. The frequent apologetic ‘I’m sorry, I’ve had a bit too much to drink’ greetings from the kids that visit the bus are met simply with a ‘Don’t worry, we’ve all been there,’ response. It’s true – we have. It does no harm to remember that we were all young once. As I approach ‘The Big 3-0’, I sometimes catch myself saying things like, ‘the youth of today…’ We forget that we were once the subject of such remarks. My experience on Saturday night taught me something important. The world is a different place now to when I was a teenager [and that’s not that long ago, thank you very much]. The kids dress differently; many of them drink more than I did at their age; and they’re faced with an even tougher road ahead in terms of getting work after they finish school. But underneath it all, they’re good kids. The social pressures may be different but the age-old right of passage is the same – we all make mistakes. Most of us have drank too much at some stage in our lives. Some of us still do. But for the kids of Belfast, at least there are people like those on board the SOS Bus to provide a helping hand. 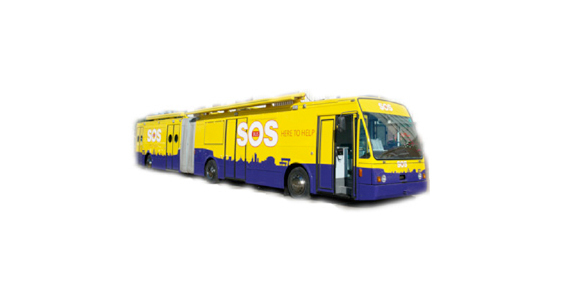 I’m lucky that I’ve never needed to call on the SOS Bus for help personally. But in my student days, when nights out sometimes ended separated from my friends, with no way of getting home, I would have been grateful to see this big yellow bus on the horizon. Throughout the night, and reflecting on the experience afterwards, I was reminded of local singer-songwriter, Foy Vance’s powerful song, Indiscriminate Act of Kindness. A lot of you will know the song. Some of you won’t. Either way, take a listen. The scenario might be slightly different but the premise is the same – a little help, offered unselfishly and without expecting anything in return – goes a long way. The SOS Bus volunteers are mothers, fathers, grandmothers and grandfathers (plus a few younger ones, like myself) that have come together to help Belfast’s young people. They see, in the kids they help, their sons and daughters; their grandchildren; and perhaps, like me, younger versions of themselves. I really enjoyed my time on board the SOS Bus. It was strange getting home just after 3.30am on a Sunday morning, completely sober but high on adrenaline. I might not be in a position to volunteer every week, or every month, but I will be back to volunteer again in the future. If you live in Belfast, you may recognise the big yellow buses that sit outside The Odyssey Pavilion and at Shaftesbury Square at the weekend. Like me, you may have even stopped by for a warming cuppa on your way home from a night out. But it’s more than just tea and sympathy that’s doled out at these distinctive behemoth buses. 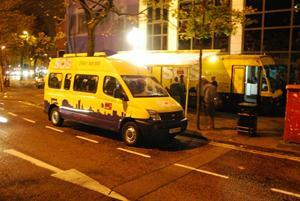 Over the last four years, the SOS Bus has interacted with over 120,000 people on the streets of Belfast, with the help of a dedicated network of over 150 volunteers. Some eight lives have been saved by their work, with hundreds of other young, vulnerable people reunited with grateful parents and countless others helped home safely. Through its work, the SOS Bus helps to reduce pressure at peak times in our busy hospital A&E departments, with an on-board medical centre that provides in-depth medical and caring support. 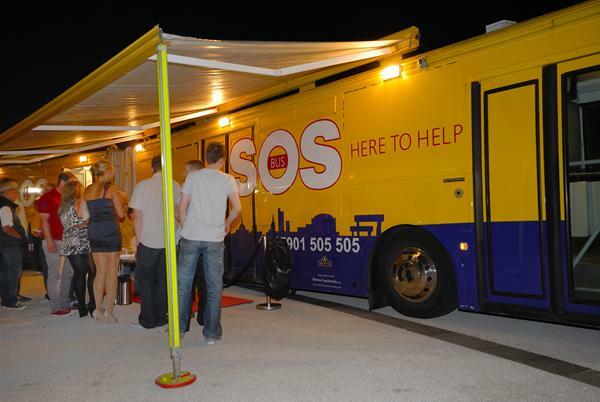 Since 2007, the SOS bus has been used to support distressed or vulnerable people who have overindulged in alcohol or drugs; have been victims of violence; are homeless; separated from their friends, or in emotional distress. And, arguably, with recent debate about 2am closing leading to an increased number of people on Belfast’s streets post pub closing time, the services of the SOS Bus are more important than ever. Having recently been introduced, through work, to SOS Bus founder, Joe Hyland, I’ve agreed to take on my next challenge as ‘The Good Samaritan’ and tomorrow night, will spend a night as a volunteer on the SOS Bus. My mother once told me that the greatest gift you can give someone is your time. It’s easy to get wrapped up in the daily grind and think, ‘I don’t have time for that’ (hand’s up – a problem with this blog and my ambitious challenge to attempt 29 different lives in 12 months). But perhaps, if we all took a few hours out to help others every now and again, we’d be better people for it. I’ve no qualms about sacrificing one Saturday night to lend a helping hand to such a worthwhile project. In fact, I’m quite looking forward to it. I just hope I can get the lyrics to ABBA’s ‘S.O.S’ out of my head before I board the bus outside The Odyssey Pavilion tomorrow night – it’s all I’ve been able to think about for the last few days. I had my first ever ‘life in slow motion’ moment at the weekend. 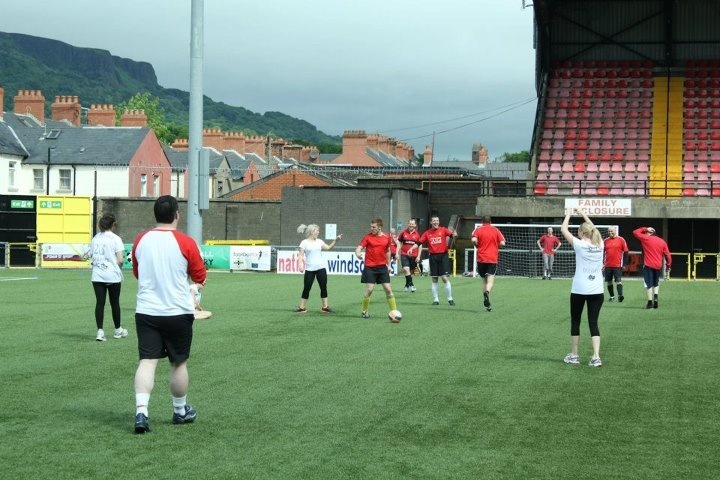 Around three minutes into our first game at a charity football tournament, I was dutifully guarding our goal when the ball came hurtling towards me. Its trajectory was heading straight towards my face. I froze. It was as if my hands wouldn’t, or couldn’t move. After what seemed like a lifetime of watching the ball spin through the air in comedic slow-mo, it smashed full force into my nose and knocked me to the ground. 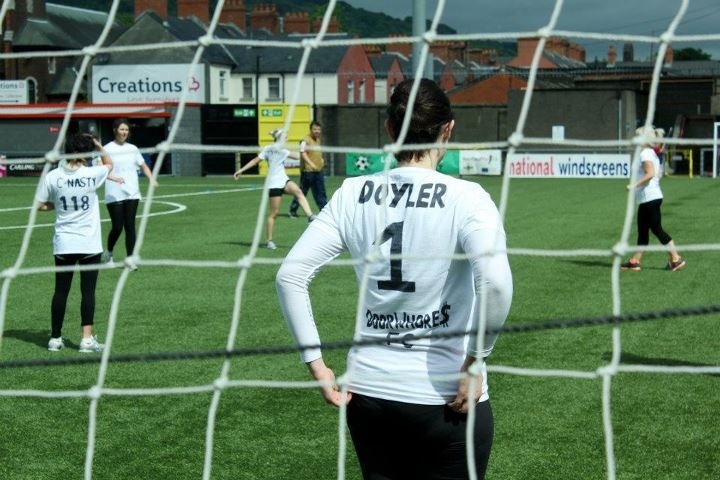 I had been roped in by my friend, Alice to join her team at Roccer – the now legendary annual Belfast charity football tournament for NI bands, DJs, venues and music fans. I figured, having attempted ‘The Sports Fan’ as one of my 29 Lives, trying my hand at ‘The Sportswoman’ might be a natural follow-on challenge. Getting hit in the face was my biggest fear of being in goal. But strangely, once it was over with and the initial shock faded, I dusted myself down and got on with it. I took one for the team. Literally. Cheers of ‘Doyler, Doyler’ from the crowd were very encouraging. 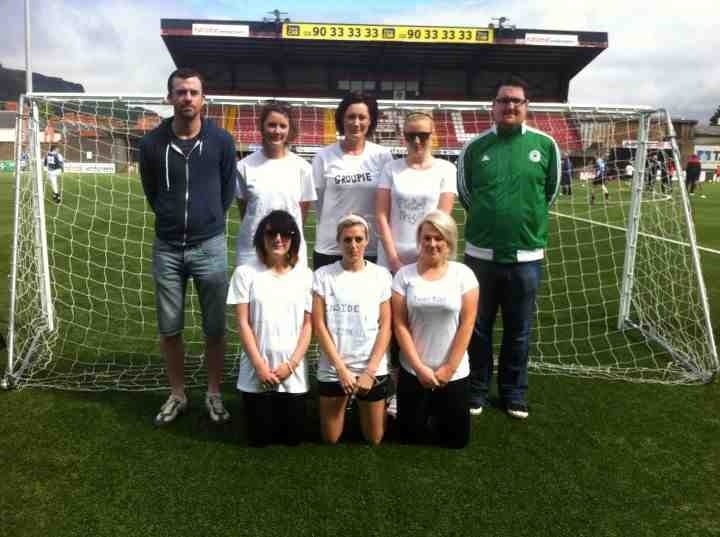 The interestingly named, DoorWhore$FC was made up mostly of the female door staff from Belfast bar/club, The Stiff Kitten (Alice, Clare, Jenna, Lily & Bronagh), with a few of our DJ friends (special thanks to our star player, Dom, plus Rigsy & Anto), Roccer snapper, Luke Joyce and me (The Groupie) thrown in for good measure. Despite only meeting a few of my team mates for the first time on the morning of the tournament, we instantly gelled, bonding whilst painting whiskers on our faces – an intimidation technique designed to put the boys off their game. It’s safe to say ‘the girls’ team’ attracted a lot of attention – drawing the most spectators to watch our matches, inciting collective cheering when passes went our way and boos when they didn’t. It turns out I suffer from selective feminism. I’m all for women’s rights; sexual equality; equal pay etc. Put me on a football pitch with a bunch of girls facing a group of burly boys however, and I will revert to high-pitched pleas for leniency and for the ref to look the other way while we bend the rules. 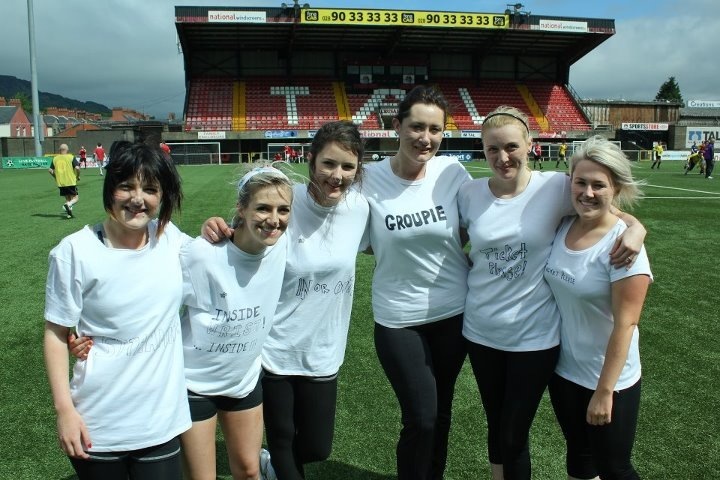 Still, no one was hurt (aside from my bashed nose & our inadequately warmed up muscles); a hell of a lot of fun was had and, most importantly, our team spirit saw us through. In the end, DoorWhore$ FC scored two goals in four matches, which, surprisingly was more than some. I even managed to save three goals – including the one that rebounded off my face. 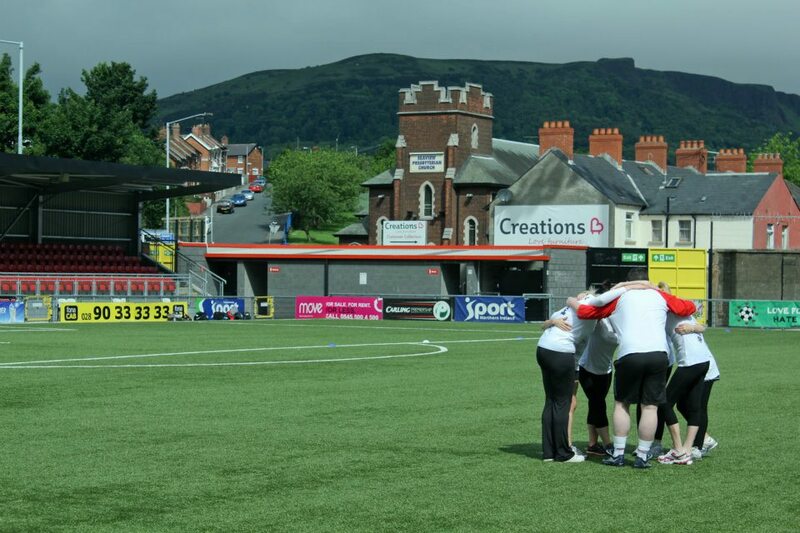 Thanks must also go to the infinitely more talented goalie, whose name I didn’t catch, that stepped in to help us out for a few matches – it was great to get a run out around the pitch for the last few games. I was chuffed to be awarded the trophy for ‘Roccer 2012 The Maverick’ – mainly props for getting hit in the face but also for entering into the spirit of the competition. 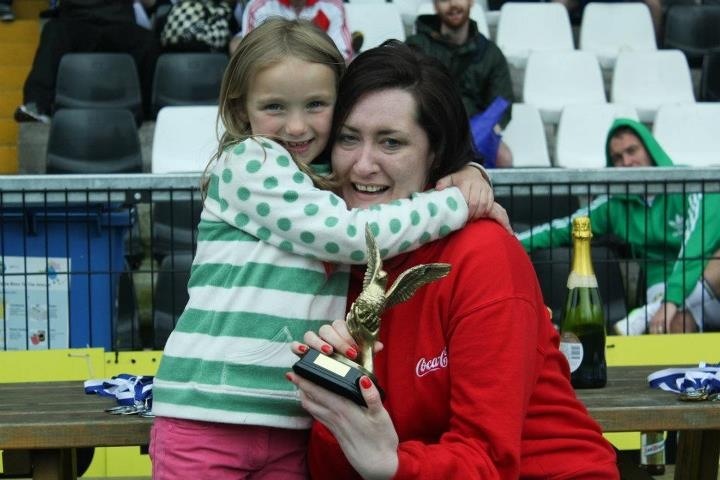 Getting my Roccer 2012 ‘The Maverick’ trophy from Miya McClean – Roccer’s friendly and very funny mascot! For more info on Roccer, and if you’d like to make a donation to support their fundraising efforts for Marie Curie, click here. Special thanks also to Luke Joyce for capturing these photos of us in action. To see more of his work, head over here. My first experience as a market trader is now in full swing. 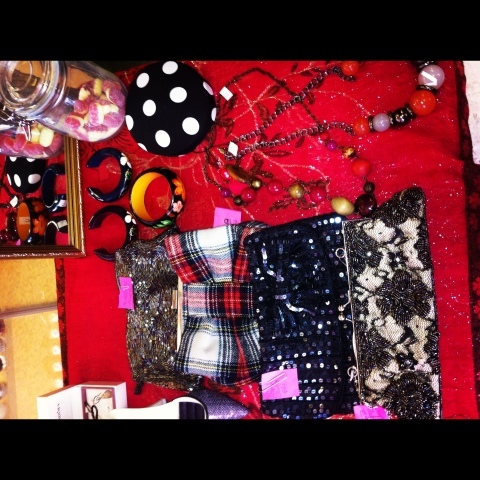 I’m currently selling my wears at the Farewell Fashion Souk at In Shops, Belfast. 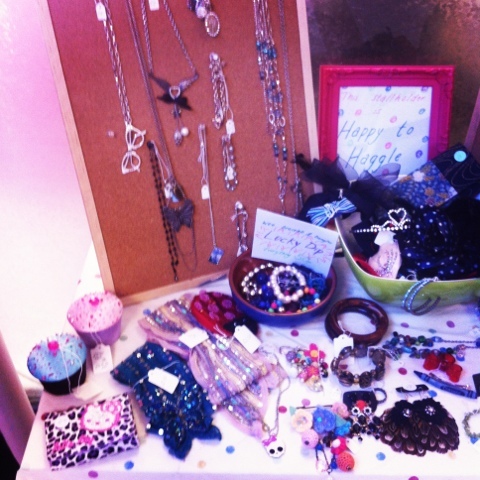 The sun is shining just outside the door, there’s free Buck’s Fizz, a great buzz, plus some fab fashion bargains up for grabs. 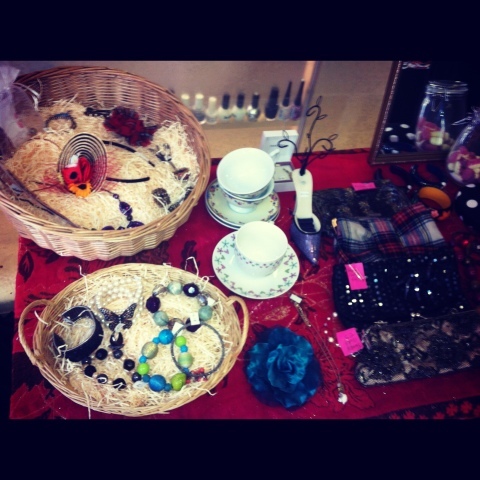 Here’s a selection of pics from my own stall and also of some of my neighbours’ stalls. Losing weight is great, except for one thing. Some of your most-loved clothes – the dresses that made you feel a million dollars; the heels that turned your legs from stumpy to slinky (yes, even your feet shrink a little when you lose weight); and the waist cinching belts that are no longer made for your waistline – become redundant relics gathering dust in your wardrobe. Your style and how you dress changes as you slim down. The style of clothes you opted for before suddenly don’t suit. Don’t get me wrong, I’m not complaining. I’m happier and more confident in my own skin than I’ve ever been. However, having a wardrobe packed to the brim with clothes ranging from sizes 8 to 18 puts my wardrobe in the league of a small boutique. It also makes deciding what to wear each day a royal pain. I have an emotional attachment to a lot of my clothes. It generally comes down to cash. I’ll sit and look at the Amanda Wakeley (still with label on) and John Lewis ball gowns hanging in my wardrobe (that are now three sizes too big) and think; “You two babies cost me the guts of £450, how can I part with you?” Then there’s the pretty but totally unpractical clutch bags I shelled out for and used once, and the stunning heels I simply can’t walk in. 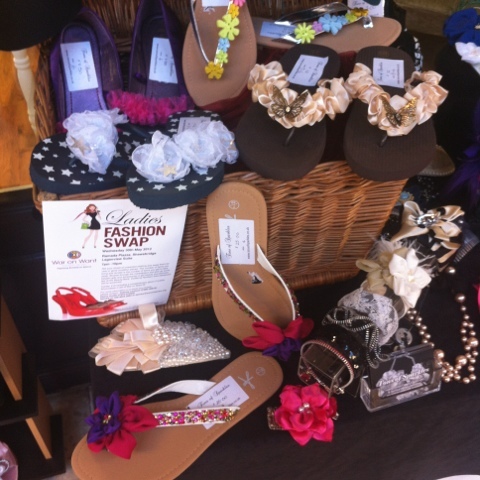 Over the last few nights, I’ve finally gotten around to having a massive clear-out, in preparation for tomorrow’s fabulous Fashion Souk, where I will have a stall. 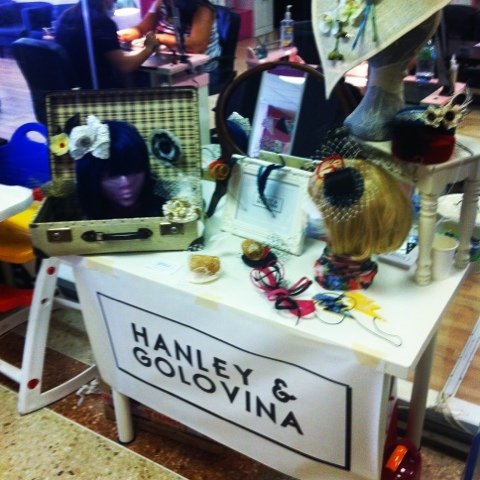 Founded three years ago by Alyson McElroy, The Fashion Souk has become a staple date in Belfast fashion lovers’ diaries, welcoming over 800 shoppers each month with its eclectic mix of traders selling pre-loved, vintage, locally made and fairly sourced clothing, accessories and homewares. Tying in with my current ‘Budget Belle’ challenge, where I’m trying to get my finances back in check, this is an attempt to satisfy my inner shopaholic – if I make some moolah selling my old clothes, I can justify buying new things that fit. 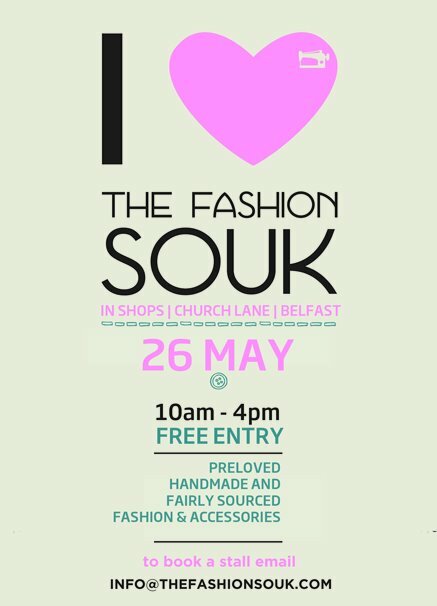 Sadly, tomorrow will be the last Fashion Souk in its current home at In Shops (just off Church Lane, Belfast), so the organisers are throwing a bit of a shindig to see the Souk out in style. The special Farewell Boutique Souk market will bring back all of its favourite traders (plus little old me) and will offer shoppers bubbly and a live DJ throughout the day. So, call down tomorrow, Saturday 26th May between 10am -4pm at In Shops, Belfast (Church Lane entrance), soak up the atmosphere, and feel free to call by my stall to see if anything takes your fancy! They say nothing in life is free, but entry is, so even better. I’ll post a few pics later tonight of the types of things I’ll be selling but there will be dresses, gowns, shoes, bags, silk scarves, jewellery and all sorts! Check out the Fashion Souk website and Facebook and Twitter to see some pics of previous Souks and also to get a taste for the type of people that will be selling alongside me. And trust me, having shopped at the Souk myself, I can say with confidence that there will be some gorgeous fashion finds up for grabs! So, it’s mid May. I turn 30 in six months and two days. After starting off with great gusto, I’ve somehow managed to get midway through my 29 Lives challenge having only achieved seven lives. I’m not going to beat myself up about it (though I have been of late and a tweet received tonight congratulating me on my blog concept almost tipped me over the edge). Sometimes life gets in the way of the best laid plans. Truth be told, I’m happier than I’ve been in a long time. Work is going well, my social life seems to have taken on a life of its own and, after seven years as a self-confessed singleton, I have a boyfriend! I’d cheat and put that last one down as a tick off the 29 but I’d only be lying to myself if I pretended this was something I sought out in any kind of contrived fashion; happily, it happened when I least expected it. But enough of the sentimental stuff, let’s get back to business. If I’m going to have a hope of hitting my 29 Lives target by November 17th, I need to get back on track. I’ve been thinking a lot lately about my lifestyle and the changes I need to make to get where I want to be. I’m back to tracking what I eat with Weight Watchers after letting things slip a little of late and it got me to thinking – things are a lot harder to ignore when they’re there, staring back at you in black and white. I’ve always been terrible with money. I’ll never be rich because I have my money spent before I get it. My mum says I’ve been like this since I was a child. I’ve never had the patience to plan and save – if I want something, I have to have it and I have to have it now. But that has to change. As I approach the big 3-0 I think it’s time to man up, take charge and accept that life is not always about the here and now – there’s a little thing called the future that takes a bit of planning for. In the short-term, another of my goals before I turn 30 is to try living on my own. If I want to do that, I’ll need to tackle this ‘spend now, worry about it later’ attitude I seem to have adopted. It’ll not be easy but first up, I’m challenging myself to document everything I spend over the next two weeks. After that I’m going to set myself a weekly budget and, crucially, try to stick to it. 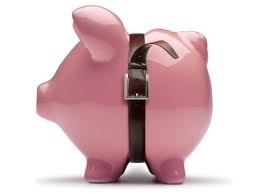 I’m not going to become a hermit or anything crazy like that but I am going to try – for the first time in my life – to take responsibility for my finances. It’s about time. It’s over a week now since my DJ debut at Palookaville. It was such a big night (and a busy work week after that) that only now – after a couple of very lazy food-fuelled Easter days off – am I getting a chance to reflect on it properly. It really was something else. My set started off a little shaky – the decks on the night were a bit different to the ones I’d been learning on & just as the doors were due to open, I managed to completely kill the sound as I was queuing up my second track. After a mini meltdown, I was back on track (literally) as the throngs started to filter into the Oh Yeah Music Centre. The club was full and sold-out in a record 20 minutes. With the Faithful Palook crowd suitably limbered up and ready to party, I had to think on my feet a little & mix things up with my track selection. Whilst I’d agonised over my set list for weeks and thought I had it pretty much confirmed in my head, there’s nothing quite like the pressure of 300 faces in front of you to make you think fast and change things around if it’s not creating the right vibe. And it seemed to work – 30 minutes in, there was a full dance floor & people were (shock, horror) dancing. It really was quite unlike any other feeling I’ve ever felt before – and such a buzz. I pretty much just played tunes I like to listen to/dance to & it was amazing to see people dancing to the tunes I’d chosen. At the end of my set my mentor, teacher & all-round great guy, Joe Lindsay & fellow Palookaville DJ/mastermind, Kenny Mathieson appeared behind me and started dancing with two 6ft inflatable T-Rexs, prompting the crowd to start clapping. In that moment, I honestly felt like a superstar DJ (the medicinal vodka may have aided this feeling) – it was utterly surreal. But amazing. I must say a very public thank you to Joe for all of his support, help & for giving me the opportunity to play at his club. Hopefully he’ll have me back someday. Which leads me on nicely to tonight’s adventure. Having gotten the taste for life as a DJ, tonight I’m off for my first experience of mega Belfast club night, Shine where legendary international techno/house DJ, Carl Cox is heading up the bill. I’m not a big raver. I couldn’t tell you the last time I was in a club that was’t playing some variation of the types of tunes I played myself last weekend. 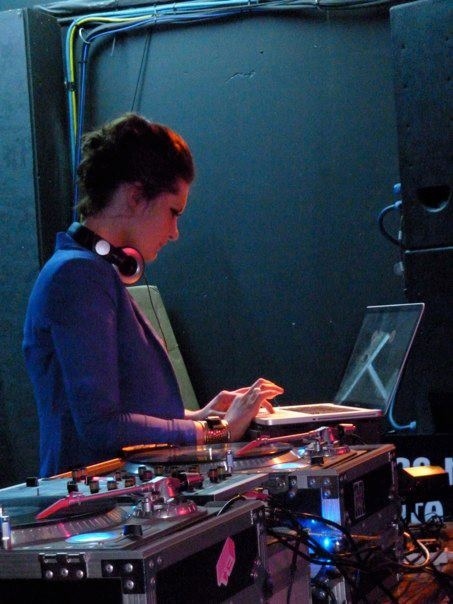 That said, I’m intrigued & think it’ll be amazing to see DJs that tour the world in action right here in Belfast. I’ve been told by many that going to a Shine party is right of passage. And seeing as I’ve lived here for six years now and have never been, I think it’s about time I ticked this one off my list. Now, where’s my glow sticks?